There are many factors that go into the development of truly compelling writers and authors. Here I cover three elements that will make the difference between you being a mediocre writer who struggles with obscurity and a gifted wordsmith who attracts a raving fan base. Even though I was familiar with all three of these aspects, I had never quite viewed them as separate but interconnected pieces before. But it’s a brilliant way to break down an approach to writing and communicating with an audience. This is the broad category that you cover or the genre in which you write. If you’re a nonfiction writer, your topic could be gardening, personal finance, self-help, or fitness. If you write fiction, you might consider labels such as mystery, science fiction, romance, or young adult. Other topics or categories you might place yourself in would be personal memoir, poetry or graphic novels. The important thing to note is that this is just the starting point for defining yourself as writer — and for how your readers define you. Think of your topic as the big picture, broad stroke view of what you do with words. The second element is your personal slant on the topic, category or genre that you specialize in. What perspective are you coming from? Let’s say you are establishing yourself as an expert on gardening. Is your message a scientific one (azaleas grow best in soil with these ingredients)? Or an aesthetic one (place these azaleas in this area of your patio for a pleasing design appeal)? Or a spiritual one (tuning into the vibration of your azaleas will help you connect with a higher power)? If you cover fitness, your message might be “Working out is hard, so toughen up and get over it!” Or it could be “Staying in shape should be fun and I’ll make it easy for you.” Wayne Dyer has a much different message with his self-help advice (“Change Your Thoughts, Change Your Life”) than does Larry Winget (“Shut Up, Stop Whining, and Get a Life!”). So what’s your message? How do you approach your topic or genre? Great. You know your topic and your message. Now comes the crucial third element: Your voice. This includes your unique writing style, your tone, and the personality and attitude that shine through your words. Let’s return to the azalea expert with the spiritual message. Her writing voice could be solemn and reverential. Or it could be playful and fun. Or any number of other spins on the subject at hand. Wayne Dyer’s gentle demeanor is in sharp contrast to Larry Winget’s in-your-face style. Neither one is right or wrong. But I assume each author is being true to who they are, and each one attracts a different audience as a result. Voice may be the toughest of the three elements to hone because it usually takes years (and even decades) to develop. But it’s also the most important of the three when it comes to attracting and retaining a following. Sure, people are interested in your topic, and they enjoy your message. But it’s your voice that keeps them intrigued and coming back for more. 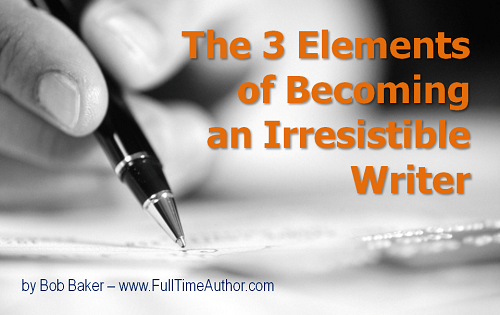 What are your thoughts on these three elements of irresistible writing? I welcome your comments below. P.S. Read Danielle LaPorte’s original blog post that inspired these ideas. Far and away, the most important is Voice. You’re right, it takes a long time to develop one. But that is what separates you, the writer, from every other writer on this planet. I would add one more element, the 4th element to becoming a better writer: Discipline. In other words, write, write, write.